Do you like tacos? How about fresh corn on the cob? Do you enjoy music? How about experiencing a cultural afternoon? If you said yes to any of these questions, this year’s Kermes (Spanish for ‘bazaar’) celebration would have been perfect for you. Sr. Margaret Garcia started Kermes in about 1993 as a means of raising funds to assist the needy Hispanic people – the Hispanics helping out their fellow Hispanics. Since that time, the celebration has grown immensely. 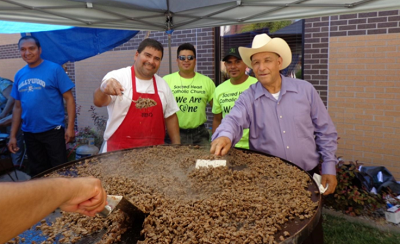 This year’ Kermes celebration changed venues from the monastery garden to the grounds of St. Mary’s Church/Norfolk Catholic School grounds. This move brought a significant increase in number of English speaking people in attendance resulting in a fabulous mixture of cultures. What a demonstration of We Are One Church/Somos Uno with so many nations represented in the festival. Besides the usual Hispanic foods that are offered, we added chalupas to the menu, as well as two parish Hispanic bands, young dancers ranging from 3-14 years of age, and several new games to the entertainment. We also made 150% more food in hopes of greater attendance (there were no leftovers). It was apparent that those in attendance enjoyed the food, entertainment, and the camaraderie despite the language barrier.